Presented here, a sweet little cricket table from the mid 1800's. The stand is 27-1/2" high and the two board top is 17-1/2" in diameter. 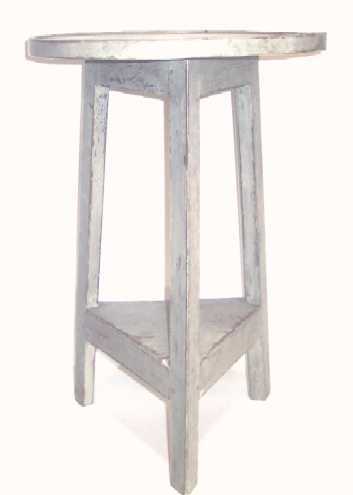 It is a very sturdy stand with pegged construction and triangular bottom shelf that adds to its stability. The back of the legs are chamfered which is an added decorative touch. The top is encircled with a bentwood band that covers the rough edge of the wood . . . another nice touch. The paint is nice and dry, just the way we like it.